Welcome to the One Small Child! One Small Child was started by Ramona Murdock over 33 years ago when she started making slips on her sewing machine in the basement of her house. She opened stores in the local community to sell her growing collection of frilly creations. Many in our community still talk about those gorgeous gowns purchased many years ago. 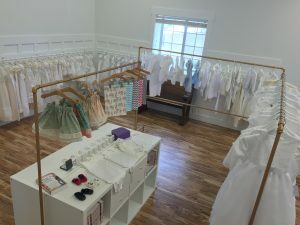 She found her niche in creating beautiful christening gowns and outfits. The gowns were originally sold wholesale in high-end boutiques and department stores including Nordstrom. In 2004 we started selling directly to the customer. We chose to sell directly to consumers so that we could more fully meet the needs of customers that need a great selection and full size ranges available to ship immediately. It has been very rewarding to have a direct connection with the customers that we serve. We love nothing more than to see pictures of our gowns and outfits being used in ceremonies, and we greatly enjoy being a part of those special memories. Please take a minute and learn more about us or just check out our shop!